Mikis Theodorakis was born on July 29th 1925 on the Greek island of Chios, and his words above are from the sleeve notes for his own recording of his Requiem. The concept of 'free people' resonates strongly for Theodorakis. He had fought in the resistance against the occupying Fascists in World War 2, and was exiled in the subsequent Greek Civil War. He then studied music at the Athens Conservatoire, and in Paris with Olivier Messiaen. Following the Greek military junta in 1967 Theodorakis went underground, and his music was banned by military decree. He was imprisoned for five months until an international pressure group including Dmitri Shostakovich, Leonard Bernstein, Arthur Miller, and Harry Belafonte achieved his release, and he went into exile in April 1970. Theodorakis continued his opposition in exile through concerts and by enlisting the support of international leaders. After the fall of the Colonels, Theodorakis returned to Greece, and took an active part in politics on a left wing ticket. He was elected to the Greek Parliament twice, and became a minister in the government in the early 1990s. He was nominated for a Nobel Peace Prize in 2000, and opposed both NATO’s involvement in Kosovo and the invasion of Iraq, and has been publicly critical of the policies of George W. Bush. 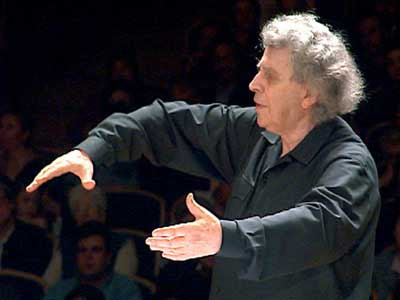 Mikis Theodorakis is best known for his music for the cinema, notably for his sound-track for Constantin Costa-Gravas' film Z which became a rallying call for opponents of the military regime, and for the film of Nikos Kazantzakis' novel Zorba the Greek which became a sound-track for tourism in Greece. But there is a lot more to Theodorakis' music, including five published symphonies, a string quartet, a Requiem, and five operas. His 1984 Requiem sets the words of the 6th century Syrian monk John of Damascus. The structure of the work follows the Orthodox Mass for the Dead, and is quite distictinct from the more common Roman Catholic and Protestant requiems. 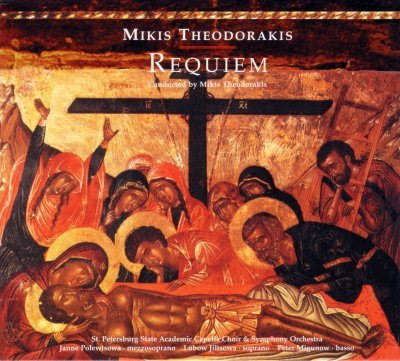 Theodorakis is best known for his music for the theatre, and his Requiem is theatrical as well as sacred music. Although rooted in the Orthodox rite it uses elements which are not permitted in the Orthodox liturgy - children's and women's voices and a full symphony orchestra, and builds Western polyphony and harmony on a Byzantine foundation. But this is most definitely spiritual music. Although sacred music started moving from the church to the concert hall in Haydn's time, Theodorakis' Requiem, thankfully, does not move as far into the concert hall as Leonard Bernstein's Mass - A Theatre Piece for Singers. An excellent recording of Mikis Theodorakis' Requiem is available, with the composer conducting (photo below) the St. Petersburg Academic Capella Children's Choir, Choir and Symphony Orchestra. The recording was made in 1997 in the Capella Concert Hall, St. Petersburg, and is on the German Intuition Classics label, as are many other CDs of Theodorakis' music. You can read about Mikis Theodorakis' songs of freedom on this path. Predictably BBC Radio 3 is not marking Mikis Theodorakis' birthday today, instead they are presenting that rarest of twentieth century music, a Shostakovich symphony. So I will make some small amends on my Overgrown Path programme on Future Radio this afternoon by playing the concluding six movements of Theodorakis' Requiem, plus the Greek Dances of Nikos Skalkottas, who studied with Schoenberg. July 29 (test) - The political dimension of the artist: Nikos Skalkottas Seven Greek Dances, Mikis Theodorakis Requiem (excerpts). Aug 5 (test) - The American Symphony: William Howard Schuman Symphony No.5 (Symphony for Strings), Aaron Copland Short Symphony, Alan Hovhaness Symphony No. 2 "Mysterious Mountain". Aug 12 - Brain Music: Thea Musgrave Helios, Howard Skempton Lento, William Alwyn Symphony No. 5 "Hydriotaphia". Aug 19 - Pierre Boulez - great bogeyman of 20th century music: Boulez Messagesquisse, Gyorgy Ligeti Violin Concerto, Boulez Rituel in Memoriam Bruno Maderna. Aug 26 - Malcolm Arnold - Neglected 20th century master: English Dances, Set 1, Guitar Concerto, Four Scottish Dances, Symphony No. 5 (last movement). Sept 2 - American minimalists: Terry Riley Cortejo Fúnebre en el Mont Diablo from Requiem for Adam, John Adams Shaker Loops, Terry Riley The Philosopher’s Hand, Terry Riley – In C (excerpt). Sept 9 - The eternal feminine: Beata Moon Piano Sonata, Elizabeth Maconchy String Quartet No 5, Elisabeth Lutyens Wittgenstein Motet, Vanessa Lann – Dancing To An Orange Drummer. Sept 16 - Contemporary sacred music: Judith Weir All The Ends of the Earth, Morten Lauridsen – Lux Aeterna, Salve Regina (Gregorian Chant), Bayan Northcott Salve Regina, Morten Lauridsen – O Magnum Mysterium. Sept 23 - Music of Lou Harrison: Varied Trio, Piano Concerto, Kunsonoro kaj Gloro (excerpt from La Koro Sutro). Sept 30 - Benjamin Britten - music does not exist in a vacuum: Concerto for Violin, The Young Person's Guide to the Orchestra. Oct 7 - New music from the Baltic: Pehr Henrik Nordgren Equilibrium for 19 strings, Peteris Vasks Botschaft (Message), Per Nogard Constellations. This is going to be real 'post-ratings radio 2.0. You can even see Pliable on the studio webcam, and send messages to the studio via the Future Radio website. To paraphrase Mikis Theodorakis this is my tiny contribution to "the rescue of mankind out of pure self-interest". Or as Libby Purves wrote - "ratings have to be watched, but calmly and with a sense of proportion. You have to believe that if even one person is swayed, or inspired, or changed, or comforted, by a programme, then that programme has been worthwhile". As ever comment, on both the schedule and transmissions if you can catch them, are welcome. Thank you Pliable. Your Greek birthday-concert for Mikis Theodorakis sounded beautiful here on my iTunes player, and I look forward to your next broadcasts on Future Radio. Like you I'm interested in the classical music life in general and in the radio. And yes, I am looking for alternatives. Therefore, instead of this misery me and other Danish music lovers are tuning in to the Internet's radio world. Thats how I found your Overgrown Path and the Radeo site. And thats how I became a daily listener to the excellent Norwegian station Alltid (Always) Klassisk. If not a Danish, I must have a Scandinavian favourite, after all. I am an Englishman currently living in Portland Oregon. I heigh from East Anglia, grew up in Norwich, went to school at Framlingham College (about which the least said the better) and spent some of the happiest times of my life singing with Benjamin Britten at Aldeburgh and elsewhere. I say this to give you a greater understanding of why I enjoy The Overgrown Path so much - it is a connection to my home, to my youth and to happy times. Thank you! By the way, your quotation attributed to Sol Hurok is also attributed to the baseball player Yogi Berra in which iteration it appears as "If people don't want to come out to the ball park, nobody's gonna stop 'em". I have no idea which, if either, of these is the more accurate.